A lot of neat stuff here...I will be putting an order in! 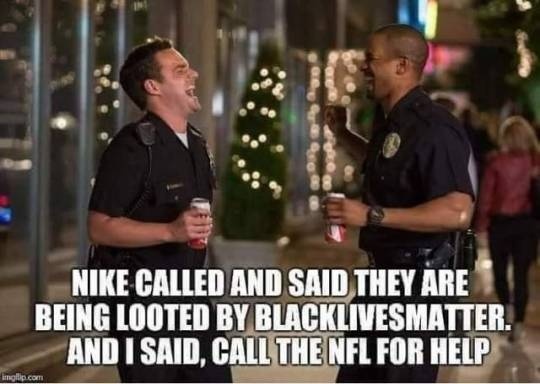 Apparently Nike is enough of a hit in the lesser half of America, they've recovered all their initial losses. And according to the business pages I've read, THAT'S what their counting on. Where is this poor Obamaville rabble getting money from to buy $250 sneakers made by slaves in Chl-Com sweatshops? Gotta be illegal possibly even Russia! funded criminal activity...send in the goons! Uhm . . . barter, I think. If you loot enuf flat-screens, Under Armour & Adidas, & sell 'em in the 'hood - you can afford them Jordans! LOL - Right. On. Queue. Now Nike has hit record highs, peddling America hatred to the trash of America. Besides...real sh*tholes haven't gone full Michael Brown in a while...that will put a crimp in demand. Plus, I don't think whoever is propping up these numbers are a sustainable crop of return customers...and how do we know there isn't a underhanded gaming of the numbers, much like a Prog book release? Is there a warehouse somewhere with pallets of shoes sitting somewhere? Anyway...back to the humorous memes! You see this? That is top-shelf pushback right there!